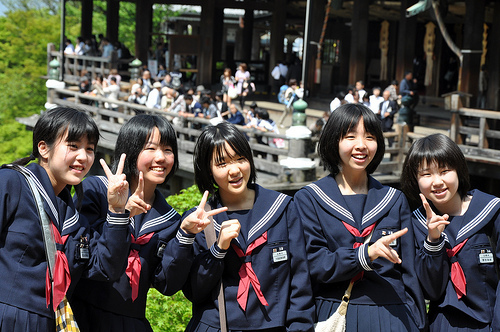 Most middle and high school students in Japan wear “uniforms” their schools have chosen. Some exceptions to that rule include private middle and high schools that allow street wear, and elementary schools that also prefer uniforms. The most common colors for school uniforms are black or navy, with summer uniforms costing between 20,000 to 30,000 yen, and winter uniforms between40,000 to 50,000 yen. Additionally, Japanese school uniforms are considered formal attire, so students can wear them to attend funerals and other similar formal events. School uniforms were first introduced in Japan during the late 19th century. This was because a more comfortable western alternative was needed to replace Japan’s more formal attire, kimono. Thus the uniforms took on a military design, with hard collared shirts for boys and sailor-style uniforms for girls. Additionally, since there was also a wide economic gap between the rich and poor back then, uniforms helped everyone seem equal to one another. As a result of this movement, some schools decided to abolish them. But after a while, the students’ crusade faded as more fashionable uniforms, including suits and jackets, became popular. Today, even some private schools that initially permitted students to wear street clothes have reintroduced the uniform, while other schools have enticed prospective students just because of their attractive clothing. There are even schools that impose strict guidelines on such “dressing down” alterations. Some teachers may measure with a ruler the length of a skirt while others stand watch outside school grounds. “There are some schools that strictly police such actions while others give freedom to uniforms that resemble street clothes. “Uniforms have the power to control the overall atmosphere of a school,” says Nishi in analyzing their effects. “When schools become rowdy, teachers police hairstyles, uniforms and tardiness, which really calms students down. “I was told to wear my school uniform when I went to town,” says student Takeda Shiori from Oita prefecture. “That is why everyone stayed out of trouble. “There is at least one student in each class who is the trend setter. With time, everyone dresses like that person. I think the short ribbon became popular because it made everyone look taller,” she explains. But Takeda herself was not influenced by this trend. “I am tall so I felt longer ribbons looked better on me. Since everyone wears the same uniform, I became more interested in expressing my individuality. I looked at how I could wear the uniform to better suit me. Sometimes I looked at other girls and thought ‘I should be careful not to dress like her. It looks sloppy,’ and thanks to that I was able to look at myself objectively,” she says.